The advantages and disadvantages of bacteria The advantages of bacteria for genetic Engineering are firstly economic- they contain a valuable source of enyzmes Bacteria produce more enzyme molecules in relation to their mass than most other organisms. The product yield can be increased by means of strain selection, mutation and optimisation of growth conditions. They are easy to manipulate genetically and can be subjected to gene transfer techniques. Secondly there is an environmental/economic advantage of bacteria- they can occupy a great variety of habitats and extremes of conditions, so their enzymes function in an enourmous range of PH and temperature. ("A New Introduction to Biology") Environmentally the bacteria used in genetic engineering chosen do not produce toxins or offensive odours and are non-pathogenic. ...read more. By inhibiting Streptococcus mutans that convertsugar to lactic acid and slowly etch away the enamel on teeth. 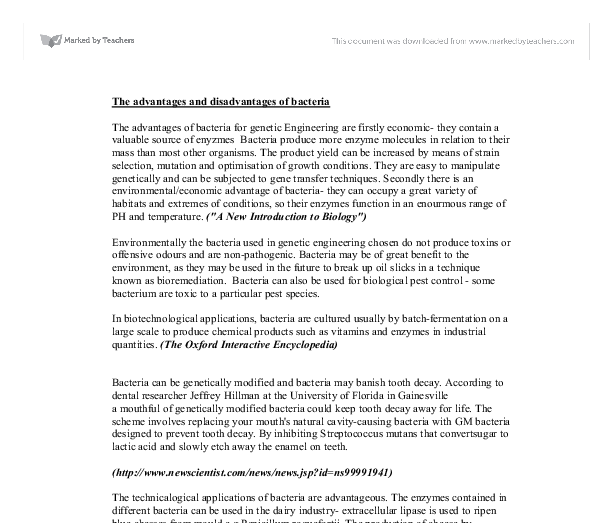 (http://www.newscientist.com/news/news.jsp?id=ns99991941) The technicalogical applications of bacteria are advantageous. The enzymes contained in different bacteria can be used in the dairy industry- extracellular lipase is used to ripen blue chesses from mould e.g Penicillum roguefortii. The production of cheese by separating milk into curd and whey may be achieved by the addition to the milk of the enzyme rennet or by the addition of a bacterial culture. Also In the ripening process, micro-organisms, most commonly lactic-acid-producing bacteria, act on the cheese to produce the desired body and flavour. (The Oxford Interactive Encyclopedia) ...read more. Many people especially on the grounds of religion think it is immoral to "play God" by the use of modified bacteria. 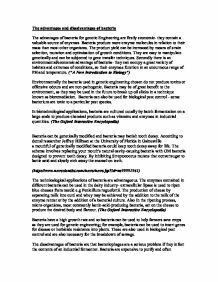 (http://www.biology-online.org/2/13_genetic_engineering.htm). The enzymes in the bacteria are highly sensitive to changes in the physical and chemical environment surrounding them- environmental disadvantage. They may be denatured by even a small temperature rise and change in pH. This means that the conditions in which they work must be stringently controlled. In particular the enzyme-substrate mixture must not be contaminated with other substances that might affect the reaction so the equipment used must be scrupulously clean- this is time consuming, so an economic disadvantage. In conclusion it seems that bacteria have more advantages than disadvantages and they may well lead to positive developments in the future. ...read more. The enzyme loses its specific shape so that the substrate no longer fits in to the active site. We say that the enzyme is denatured. Measurements: We used 6 different temperatures in this expirment: 25�C (24�C),30�C (29�C), 35�C,40�C,45�C (44�C) and 50�C (49�C). The concentration of sodium hydroxide solution needs to remain the same (0.1M). As I am not mixing up new batches each time there should be no inconsistencies here. There is also a variable here. By using the same solution for the whole experiment, careful consideration must be taken to ensure that it does not evaporate. Antibiotics produced by Bacteria: * Tetracycline * Sreptomycin * Cyclohexamide * Neomycin * Cycloserine * Erythromycin * Kanamycin * Lincomycin * Nystatin * Polymyxin B * Bacitracin In many cases the immune system can wipe out a bacterial infection on its own. Investigating the effect of four antibiotic agents on gram positive and gram negative bacteria. The active ingredient, which is responsible for garlic's anti-viral and anti-fungal properties, is allicin. This is also the ingredient that is responsible for the smell. A peeled garlic clove has little smell but as soon as it's crushed, the aroma is overwhelming. This method help scientist to identify and characterize bacteria, as they are colourless and cannot be viewed under the microscope clearly. The bacteria will either retain the strong blue color of gentian violet or red. They can be identified as spherical (cocci), rod-shaped (bacilli), or corkscrew-shaped (spirochetes). wishes to separate out the individual colonies of different species of bacteria. Liquid cultures can also be grown using essentially the same method, but instead of the inoculating loop being run over agar, it is swirled in a nutrient broth solution.